Summer Menu Items Have Arrived…Early! With day dreams of beach trips and pool days swimming in our mind, we decided that now is a good time to start our new summer menu items! It’s never too early to get a jump start on having some fun in the sun. Read on to learn about our tasty new items! 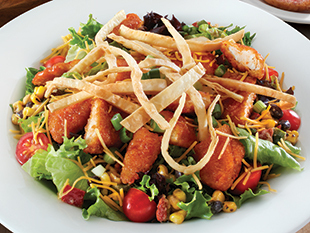 A salad fit for the Fourth of July! It features crispy chicken fillets tossed in Sriracha wing sauce and served over mixed greens with roasted corn and black bean salsa, tomatoes, green onions, cheddar cheese, and crispy tortilla strips. It’s served with our homemade Ranch dressing and bakery-fresh seasonal bread. Healthy has never tasted so good! This salad boasts julienne sliced grilled chicken breast served on a bed of mixed greens and spinach. 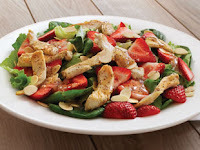 We then top it with sliced strawberries, toasted almonds, and our warm poppy and sesame seed dressing. Plus, it’s served with bakery-fresh seasonal bread. It’s time to get zesty! 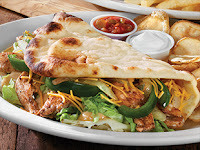 This soft flatbread is grilled and stuffed with fajita grilled chicken, onions, green peppers, cheddar cheese, crisp lettuce, and chipotle sauce. We serve it with sour cream, salsa, and your choice of one side. Howdy, partner! Enjoy our Black Angus burger on a bed of sweet potato fries and topped with caramelized onions, crispy bacon, cheddar cheese, and BBQ sauce. 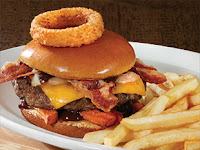 Plus, we add an onion ring on top and serve it with your choice of one side. Our fan favorite is back! 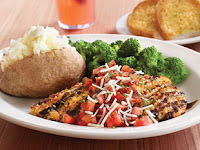 This dish features herb-crusted baked chicken breast topped with our homemade bruschetta and is finished with a balsamic glaze and Asiago cheese. We serve it with your choice of two sides and bakery-fresh rolls. We’re also currently featuring it as one of our Salad Bar Dinner Deals! Enjoy hand-breaded local zucchini (in season) layered with locally-made sliced ricotta cheese and marinara sauce. It’s topped with mozzarella and Asiago cheese and is served with your choice of one side and garlic toast – and it’s also available as one of our Salad Bar Dinner Deals! You’ve asked and we’ve listened…our Fried Ravioli appetizer is back! 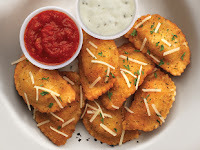 We serve it with both Alfredo and marinara sauce for your tasting enjoyment. 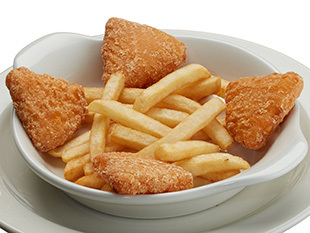 We’ve also updated our Kids’ Menu with some new items! 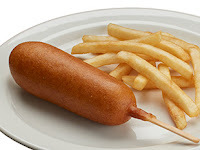 The kiddos can now enjoy Mac’n Cheese Bites, a Corndog, or Ziti with their choice of one side! Click here to see our full Kids' menu! What happened to the fruit salad. This was always a summer favorite. Wishing you could put some vegan items on the menu. I think both vegans and vegetarians would appreciate that. We are not offering the Fruit Salad this year but we will make sure to tell our menu development team that you miss it! Is the zucchini lasagna gone???? Hi Melissa! 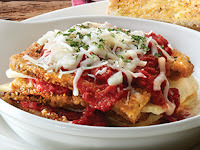 Yes, our Zucchini Lasagna is no longer on our menu becuase it was one of our limited time summer specials. However, we'll let our team know you liked it and want us to bring it back next year! Hi Melissa! Unfortunately, we are not bringing back the Zucchini Lasagna at this time. However, we will make sure to let our menu development team know that you miss it! I just tried the zucchini lasagna. Omg, itsi so good!! Free Slice of Strawberry Pie!